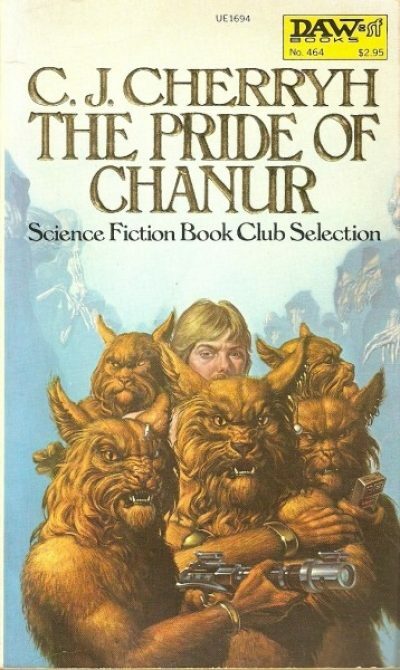 C. J. Cherryh’s 1981 (1982 for the expanded version) Pride of Chanur might therefore seem to be an odd choice for me to review, since the hani are very clearly modeled on terrestrial lions and lions are, as we know, big cuddly cats who just to hug us all. Or ingest us. It’s one of those. The Compact occupies a region far enough from Union/Alliance space to have been hithertofore overlooked by humans, but close enough for an unwary and unarmed merchant ship to blunder into it. The Compact comprises seven technologically sophisticated species, each shaped by its own evolutionary history. Despite significant communication challenges and behavioral differences, the seven have managed to coexist, if not always peacefully. By mere chance, the hani trading ship Pride of Chanur is boarded by a desperate fugitive while the ship is docked at the Meetpoint Station. The fugitive has seized this opportunity to escape from its captors, the rat-like kif. For reasons that seem sensible at the time, Pyanfar Chanur grants the furless, blunt-fingered alien sanctuary. By doing this, she is denying the kif something they view as their property. The fugitive’s would-be owner, the kif Akkhtimakt, captain of Kahakt and a person of influence amongst his people, cannot let the affront pass. That would make him look weak and weakness provokes attack within his society. Akkhtimakt takes out his immediate frustration on a nearby hani ship, obliterating it—even though the ship is in no way connected to Pride. He then begins to orchestrate an impressively large-scale vendetta against Pride. Fleeing from the kif gives the crew of Pride time to learn about their new passenger. It calls itself Tully and is at present the only example of its species, the humans, currently in Compact space. Tully is the sole survivor of four unlucky humans whose unarmed merchant ship ventured into kif territory. While the kif are a generally unpleasant, predatory lot, their obsession with Tully suggests that they think humans are either potentially very very valuable or very very dangerous. Either way, the kif want him back. Cherryh borrows from animal behavior here, at least for the hani. The hani are based on lions, as they were understood in 1980 (I believe Science has, as science does, Marched On). The females do all the work that matters, the males look pretty and pick fights. Not to venture into contentious ground here, but the supply of males seems to be grossly in excess of any possible demand. I would guess that hani history must have included periods in which dominant males and the general female population took steps to limit future conflicts by resorting to male infanticide, although there is nothing in the text to suggest that. There is a hint in this story that the gender essentialist culture of the hani is based on faulty models, and that males can learn useful trades if only someone would allow them to try. As I recall the series, that theme is developed more fully in later books. Is there an intended subtext to a species in which one gender is assumed to be incapable of anything outside a limited domestic role? I couldn’t say. I am less sure which models Cherryh had in mind for the other species, if she had any. Well, Tully’s some kind of cooling-optimized primate but the others? I called the kif rat-like but their physique is more weasel than rat. The kif are very lucky that the human ship they ran into was a merchant ship and not, say, Norway. Or a Manzianni fleet. Armed conflict within the Compact seems to occur on a retail scale. Humans may have a unique capacity to conduct mass warfare. Cherryh’s Union/Alliance setting has something of a Fermi Paradox problem, as so many SF novels do. The Milky Way is filled with sentient spacefarers, many of them from Earthlike worlds. As far as I can tell, this isn’t a recent development; the Mahendo’sat may have given the hani FTL, but that seems exceptional. Aside from the list of poor bastards who hired the mri , there doesn’t seem be a lot of churn and extinction in this universe. If this is so … why weren’t Earth and the other habitable worlds colonized and exploited hundreds of millions or billions of years ago? This issue is not unique to Cherryh, of course, but I wonder about this issue every time it comes up. My copy of this book is the 1982 mass market paperback. I note with some interest that while the book itself focuses on hani Pyanfar (who, like her crew, is female), the back of the book focuses on Tully, human and male. This is one of the books that helped set my expectations for Cherryh novels. Pyanfar is off-balance from the beginning; she doesn’t grasp the depth of the crap she is stepping into when she tolerates Tully, she has no idea what he is (or even if he’s intelligent), and of course Tully is even worse off. Once the plot gets moving, it just keeps building momentum. When I took this book off my shelf, I was very surprised to discover that it is only 224 pages. I had remembered it as more along the lines of 350 pages. This is because there is about 350 pages worth of plot in here: chases, confrontations, and court scenes. The Pride of Chanur was followed by the Chanur’s Venture trilogy (Chanur’s Venture, The Kif Strike Back, and Chanur’s Homecoming) which was in turn followed by the stand alone novel Chanur’s Legacy. 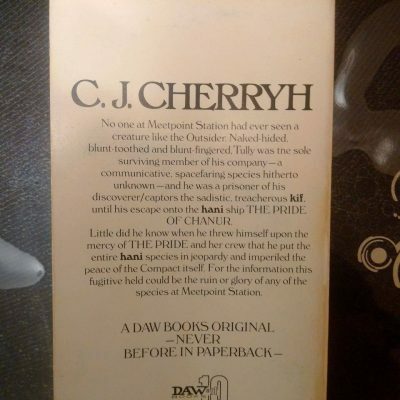 Currently, if you want to purchase Pride, DAW offers it as part of the omnibus The Chanur Saga which includes Pride plus the first two books of the Chanur’s Venture trilogy. That seems like an odd way to package the books; I cannot guess why it was done that way. I believe that there are also plans to release all five books as individual ebooks. 2: I expect to die and be eaten by my cats. If I am very lucky, it will happen in that order.